Photo by Jonathan Hession. Copyright 2016. Deadline reports Danish actor Alex Høgh Andersen has been cast as a series regular, on the Vikings TV series on History. According to the report, you can get your first look at Andersen in tonight’s fourth season finale. SPOILERS. Here is a set-side photo from Andersen’s Instagram. Ragnar Lothbrok’s (Tavis Fimmel) son, Ivar the Boneless, who is more dangerous than he appears. His character, along with Ragnar’s other offspring, have been featured as children until now but will make the transition to adulthood as part of a widely speculated time jump, which had been revealed by pictures of the cast from the set. Ivar’s grown-up brothers are played by Jordan Patrick Smith (Ubbe), Marco Ilsø (Hvitserk) and David Lindström (Sigurd). Going forward, Andersen is expected to become a lead in the series as historically, Ivar was a prominent Viking leader and a commander of the Great Heathen Army. What do you think? Have you been watching the fourth season of the Vikings TV show? What do you think about aging Ragnar’s sons, for the fifth season? Tell us! 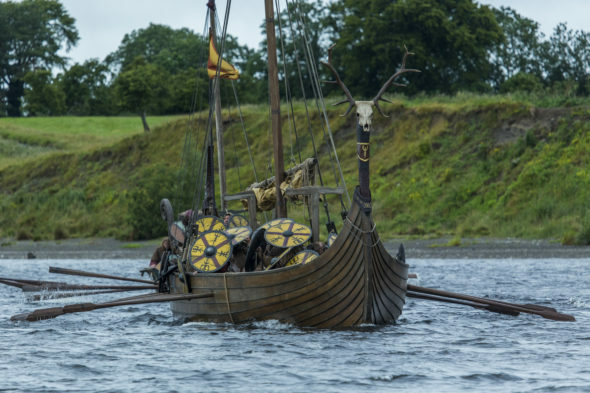 More about: Vikings, Vikings: canceled or renewed?